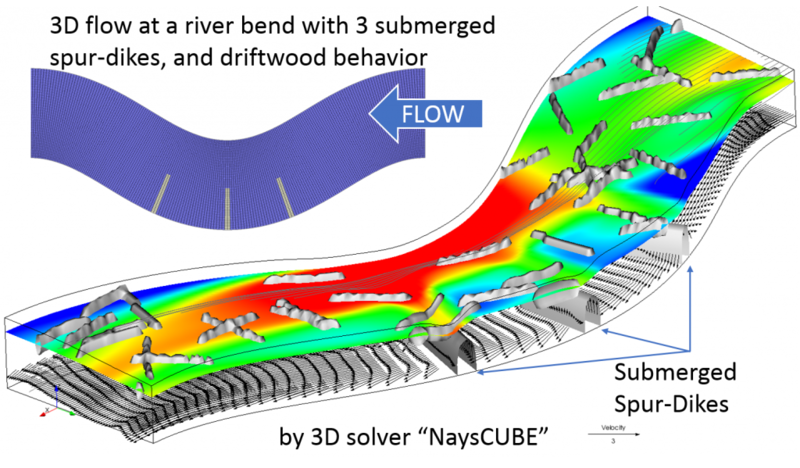 NaysCUBE is an unsteady fully three-dimensional solver for river flow and bed morphodynamics written by Professor Ichiro Kimura of Toyama University. The approach solves the basic equations of three-dimensional flow incorporate the nonhydrostatic water pressure associated with strong vertical accelerations and velocities. The user can choose from a variety of turbulence closures including a non-isotropic higher-order k-ε treatment. 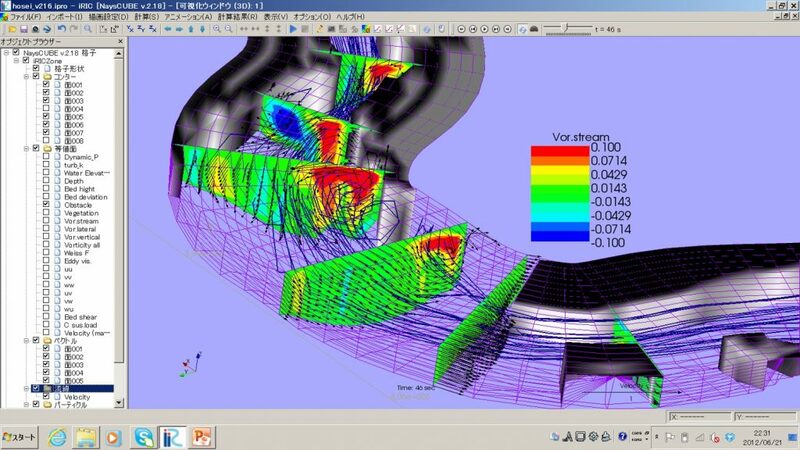 This solver can simulate fully three-dimensional flow phenomena, such as the secondary current of the first second kind, the horseshoe vortex around river structures, as well as the associated bed morphodynamic features. This solver covers a wider range of phenomena compared with 2D models, although it requires one-order (or more) larger CPU time. 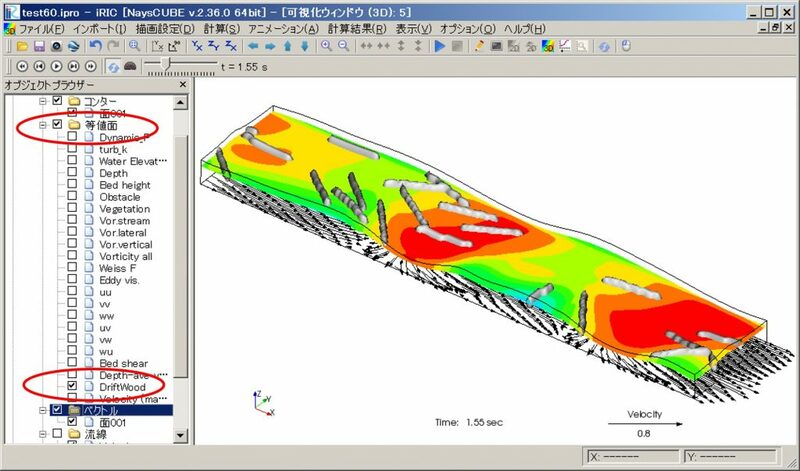 Therefore, this solver is suitable to be applied on a limited river reach for detailed analysis. The following figure shows an example of simulation of secondary flow of the first kind at a river bend. The following figure is an example of the simulation of the secondary current of the second kind in a rectangular straight open channel flow. NaysCUBE ver.3 also includes a new module for simulating driftwood transport as shown in the figure below. This solver employs a generalized curvilinear coordinate system which is transforms the complicated river topography to a group of cubes. The name of the solver comes from this transformation process. Try “NaysCUBE Example (Real River Version)” and enjoy the interesting world of 3D simulations for rivers! 3 examples for naysCUBE on iRIC ver.3,including driftwood,river bend and secondary current of the second kind. Solver manual for NaysCUBE ver.3.00.6. The changed parts from the previous version is shown as yellow shadowed.